In January I started a new Wednesday routine: I load a bin or two with sheet pans, measuring cups, pastry cutters, and parchment paper; aprons, bowls, required ingredients, and recipe packs; drive the 40 minutes to venue where I unload, sanitize, and set up a teaching kitchen for a group of 8-12 year olds. The space is tiny, the oven is not ideal, but the students are eager, sometimes excepting Junior who attends by default, and we bake. We are a homeschooling household. While there are many misconceptions of homeschooling and homeschoolers, I will simply say that we chose this path for Junior’s education as it best meets the learning requirements of his right-brained self. We cover all the subjects required by our state, we get assessed every year, but we most certainly do not stay home. Homeschooling, or home-based instruction, means we as parents get to guide our child’s schooling path. We could choose to take classes through our school district or through state online programs; we could choose to take classes through one of several homeschool coops; we could organize our own classes with a group of families, hiring an instructor for any given subject; we can learn through books, movies, video games, the public library, an established curriculum, field trips, most of which we employ at one time or another. Our beloved Seattle Homeschooling Group has partnered with two of our city community centers to provide weekly classes for families. As a mom, a homeschool teacher, and a baker, I chose to lead a fearless group of student bakers. The actual time in the community center’s own Tiny Kitchen has to be thought through like a well-choreographed dance. We have an hour to demonstrate, then mix, roll, shape, bake, clean up, and taste. Each recipe dictates whether we will work individually, in small teams, or as one group. Sometimes the students do the measuring, but if timing is tricky, they will add pre-measured wet to dry. Who knew that making biscuits could take such a long time?! As everything hinges on baking time, we sometimes shape/bake one recipe, then while baking, we measure/mix another recipe to finish at home. Before getting to the kitchen, however, I need to find the recipes, test the recipes, re-write the recipes in a consistent, easy-t0-follow way, along with information pages regarding ingredients, methods, and equipment. 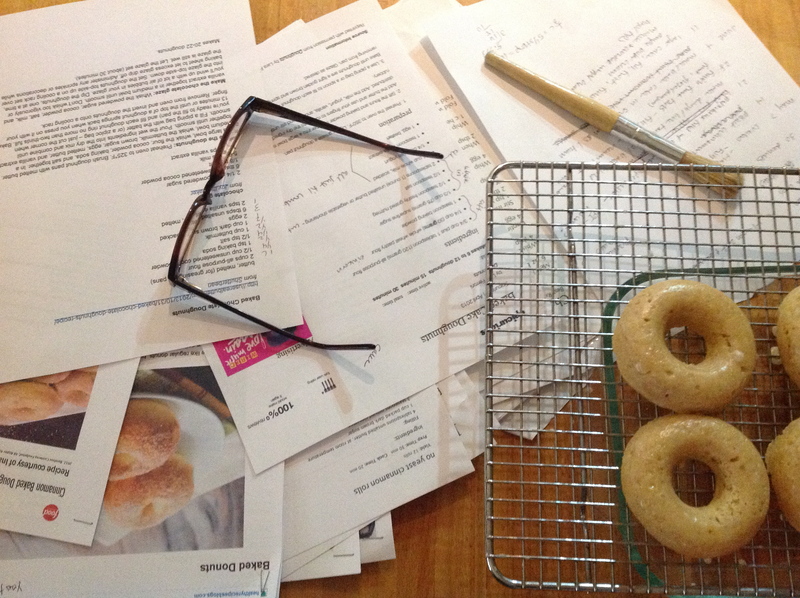 As with many areas of cooking and baking, I have the recipes down that I use at home on a regular basis. For a class, one in which I want to share method and taste experiences, I need to find good recipes for things I don’t necessarily make, recipes that will work in our facility, within our timeframe, and with my group of bakers. While I look for recipes that call for lower amounts of sugar, budget limitations keep me from introducing the more expensive alternative sweeteners, such as my dear coconut palm sugar. When recipe testing, I make the smallest batch the measurements will allow, I don’t want to mess around with anything less than 1 whole egg, and then send most of the finished product to Spouse’s break room. The office break room is an excellent abyss to toss in loads of sugar, butter, and flour! On chocolate chip cookie day, Spouse took 6 versions of 3 different recipes, set up a taste test, and tallied the results. The least favorite cookie was that with the least amount of sweetener, coconut sugar at that, and a little more whole wheat flour. I didn’t use that recipe in class. 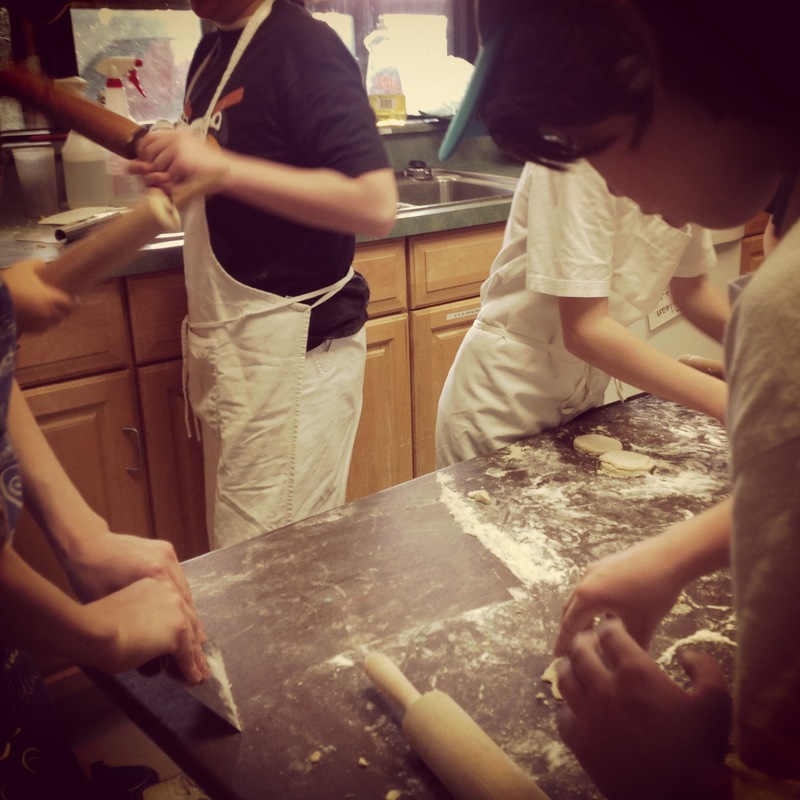 Winter Session had us making pretzels, pumpkin bread, pancakes, and hand-pies. Spring began with scones and will continue with breadsticks, baked donuts, fish crackers, and a triple layer, chocolate whipped-cream filled, buttercream frosted yellow layer cake, unless there is a mutiny and the students demand a chocolate cake like last time. The chocolate cake was really good. So good that I’m leaving it here. Bon appetit! 1. Butter 2 8-inch round cake pans. Scatter flour around, coat butter, knockout extra. Cut a circle of parchment paper to fit the bottom of each pan. Place in pan. 2. In a medium-size bowl, whisk together the flour, sugar, cocoa powder, baking soda, baking powder, and salt. Set aside. 3. In the bowl of a stand mixer (or use a hand mixer in a large bowl) combine the eggs, buttermilk, yogurt, canola oil, and vanilla. Beat together until smooth. 4. On the lowest speed, slowly add the dry ingredients to the wet ingredients. Mix on low until there are no more clumps of flour. Scrape sides and bottom of bowl. 5. Pour in the hot coffee and mix until combined. 6. Pour the batter into the cake pans. Try to make the two pans have the same amount of batter. 7. Gently place the pans into the oven. 8. Bake for 20 minutes then check the cakes. Bake these until the tops are just set and no longer wiggly. This cake should be moist so try not to over bake. 9. Let cool, then run a knife around the edge of the pan. Put a piece of parchment on a plate. Place the parchment and plate upside down over a cake pan. Flip the cake pan over so the cake will fall out onto the parchment-lined plate. Repeat with 2nd cake. Cakes should be completely cool before frosting. Wrap each layer in plastic wrap, place in a Ziploc bag and put in the freezer. Cold cakes are easier to fill and frost. (the freezer doesn’t dry out the cake like the fridge will). Recipe from Somewhere on the Internet. How lovely to teach them! And delicious looking bakes! I’ve been teaching baking to our little group of homeschoolers too! It’s a messy and time consuming affair, but worth it. That was a lip-smacking good post. 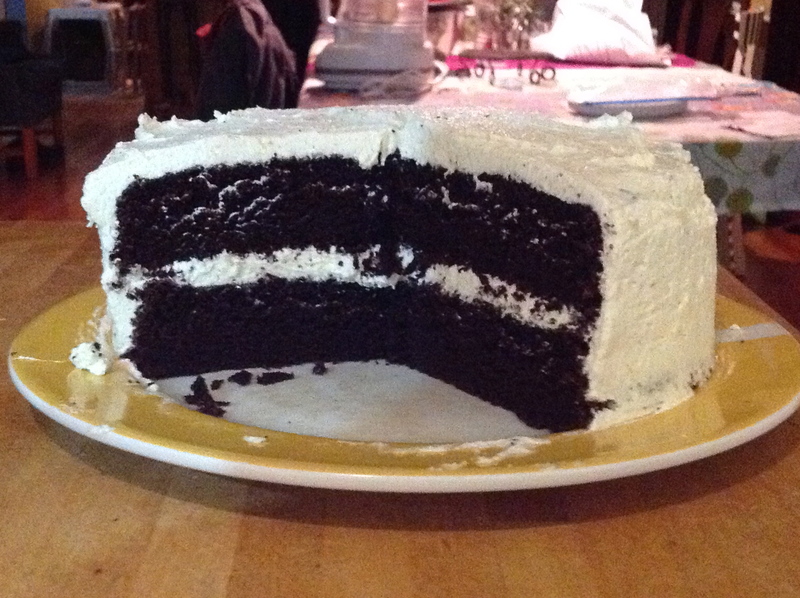 I can just almost taste the chocolate cake with the whipping cream filling. Thanks for your wonderful writing, this one was especially tasty.